Publication of the week: Barry DiGregorio et al. A new paper published in the Journal of Geology by BCAB researcher Barry E. DiGregorio, David Krinsley, Ronald Dorn, Josh Razink, and Robert Fisher makes parallels between manganese oxide rock varnish on Earth and on Mars. The researchers have calculated the growth rate of rapidly forming rock varnish found on rocks on the Erie Canal in Western New York State in the USA. The paper also calculated the number of manganese oxidizing microbes it would take to form the 15 micron layer they observe. 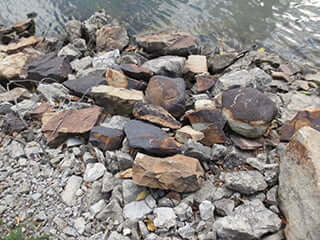 DiGregorio discovered the fast growing rock varnish coating rocks along the north bank of the Erie Canal in 2003 and has since been studying it. The authors of the paper have dated when the varnish began to form based on the time period the rocks were blasted out of numerous sandstone quarries along the canal from 1908-15. Since rock varnish is known to only grow on rocks exposed to the atmosphere, the authors of the paper based their calculations on the time period when the rocks were excavated out of the quarries. “We feel our data also may have important implications for the manganese oxide coatings found on Martian rocks that have been reported by both the Mars Science Laboratory (MSL) and the NASA MER rover Opportunity science teams. We have demonstrated that a 15 micron layer of manganese oxide rock varnish can form on sandstone rocks through microbial action in as little as 50 to 100 years. We have also found microbial remains in various states of decay within this varnish suggesting that the manganese varnish can preserve these features for at least 100 years or more,” said DiGregorio. The authors conclude that if microbes are creating varnish on Mars in a similar way, any organic material entombed within it should be able to be detected by analyzing the manganese oxides by the Mars Science Laboratory organic analysis instrument known as SAM. Essentially, the MSL rover would collect a sample of a specific rock identified to have a manganese oxide coating on it and run it through SAM. NASA’s MSL has shown that its landing site in Gale Crater was once a large lake with all the basic elements needed to make it a habitable environment for life. Add to this the evidence for recent liquid water activity that has been found on the slopes of Mount Sharp by NASA’s Mars Reconnaissance Orbiter spacecraft. This is the mountain on which MSL is currently climbing and exploring. “The exciting possibility now exists that manganese oxidizing microbes on Mars today could be still at work making rock varnish coatings. It would also go a long way to support the findings of 1976 NASA Viking biology experiment known as the Labeled Release experiment which returned strong evidence of microbial activity on Mars,” DiGregorio said.